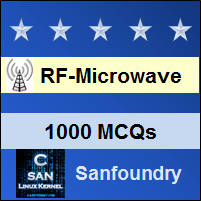 This set of Microwave Engineering Multiple Choice Questions & Answers (MCQs) focuses on “Antenna Basics”. Explanation: The basic requirements of a transmitting antenna are high gain and efficiency while requirements of receiving antennas are low side lobes and large signal to noise to ratio. 2. _________ is a device that converts electrons to photons or vice-versa. Explanation: Antenna is a device that converts electrons into photons or vice versa. A transmitting antenna converts electrons into photons while a receiving antenna converts photons into electrons. Explanation: Basic equation of radiation is given by iL=Qv. i is the time change in current, l is the length of the current element, q is the charge v is the acceleration of the charge. 4. When the separation between two lines that carry the TEM wave approaches λ the wave tends to be radiated. Explanation: When the separation between two lines that chary the TEM wave approaches λ the wave tends to be radiated so that the opened – out line act as an antenna which lunches a free space wave. Explanation: The three patterns required are, θ component of the electric field as the function of the angles as θ and φ, the φ component of the electric field as the function of the angles θ and φ, the phase of these fields as a functions of the angle φ and θ . Explanation: The beam width of an antenna measure at half of the maximum power received by an antenna or the 3 dB beam width of the antenna is termed as half null beam width. Explanation: Half power beam width of the antenna is obtained by equating the field pattern of the antenna to 0.707 (half power point) and finding θ. 2θ gives the value of beam width. Solving the given problem in the same flow, half power beam width of the antenna is 660. Explanation: Half power beam width of the antenna is obtained by equating the field pattern of the antenna to 0.707 (half power point) and finding θ. 2θ gives the value of beam width. Twice the half power beam width gives the first null beam width. With the same steps applied, the half power beam width of the antenna is 450. First null beam width is 900. Explanation: The beam area is the solid angle through which all of the power radiated by the antenna would stream if P (θ, φ) maintained its maximum value over beam area and zero elsewhere. This value is approximately equal to the angles subtended by the half power points of the main lobe in the two principal planes. 10. Power radiated from an antenna per unit solid angle is called radiation intensity. Explanation: Power radiated from an antenna per unit solid angle is called radiation intensity. Unit of radiation intensity is watts per steridian or per square degree.